I would like to tell you two stories in which – with a little help – you can find some striking parallels. The first story is about the life of a man whom I hold in deep respect. I believe he is one of the most remarkable Czech personalities, a perfect ambassador of his country. He has worked his way up to join the world’s elite. He describes his work as a craft and as a craftsman he is outstanding. If we are to be proud of someone, he is definitely one of the best candidates. We should be as proud of those who passed away long ago but influenced the development of our country over the centuries. That’s the second story, about the life and deeds of our monarchs, with a little bit of genealogy thrown in. With more or less distinction, more or less flair – they all represented our homeland once. It’s true that the time when we had a monarch at the head of our state seems very far away to us. Yet if we look at the passing of time from the perspective of the thousand-year old history of our state, we will find that the period without princes and kings is much, much shorter. This is so in the majority of other European states: they have only been republics for a few decades. In some countries they haven’t changed the system of government and they still have a monarchy. A case in point is the United Kingdom which is appealing to us because of its particular brand of humour, respect for tradition, unwritten constitution, and the Royal Family – the centre of our attention now. We haven’t seen each other for three months but Miroslav Ondříček picked up the conversation exactly at the point where he had broken off in the restaurant U vladaře in Maltézské square in June 2006. We had met there that day to continue our irregular meetings. 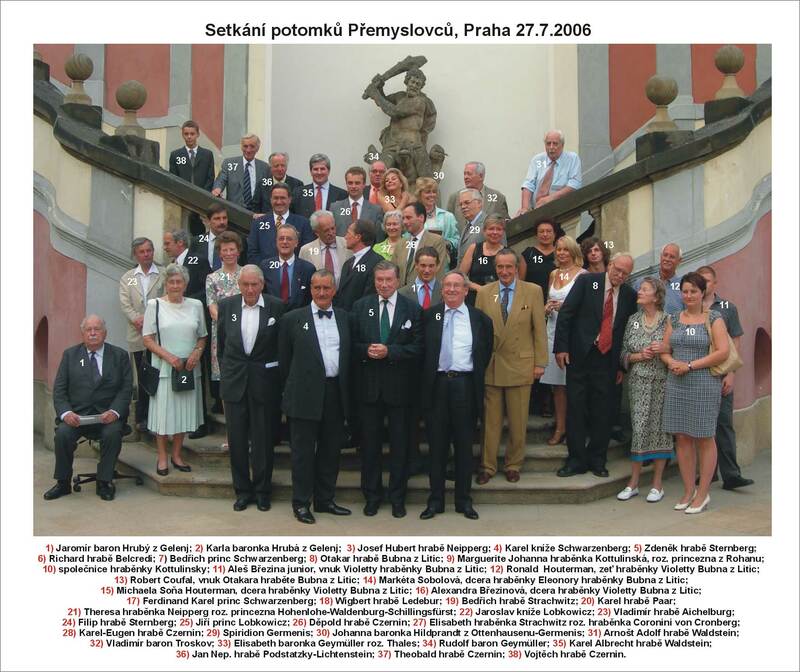 We had been talking about a family tree of the Premyslids and their offspring on the Czech throne, which my colleague Pavel Loužecký and I were preparing for the Czech National Bank and the National Heritage Trust. It was to commemorate the 700th anniversary of the extinction of the first royal dynasty of the Premyslids. I mentioned I had a project in the pipeline that would highlight something which many people may not realise – that the English queen is a descendant of the Czech royal line and of other Czech noble families. Well, Mr Ondříček says to me after a while, ‘Finish your work. There will be a show of my films in London in November and I will take it with me. I called the poster ‘Genealogical Table of English Queen Elisabeth II and her husband Philip, Duke of Edinburgh, in relation to their Czech ancestors’. The Queen and her husband celebrated their golden jubilee and it was seemly to give them a little present. May I remind you that her ancestors include Czech King George of Poděbrady and his second wife Johanna of Rožmitál. Doesn’t this remind you of anything? It does to me. The goal of the celebrated journey of an embassy of the Czech King visiting the European royal courts was to enlist their support against Turkish expansionism and to enhance the prestige of the Czech Kingdom. They even went to ‘the end of the world’ as Portugal was known at that time. Inter alia, the embassy visited England, France, Germany, the Low Countries, Portugal and Spain in the years 1465-1467. Setting out on the journey from the Blatenský castle, the embassy was led by a nobleman and diplomat, Lev of Rožmitál, brother-in-law of King George and his wife Johanna. More than 500 years ago it was the embassy of forty Czech nobles and knights travelling to the England of King Edward IV of York from the House of Plantagenet, now it was the Czech cameraman in the United Kingdom of Queen Elisabeth II from the House of Windsor. Lest Miroslav Ondříček feel lonely he was accompanied on his trip by some modern ‘noblemen and knights’ who took the photographs. Just like the English Queen and her husband, they are descendants of the first Premyslid ruler on the distaff side. They assembled in Prague and at the Mělník castle to commemorate the 700th anniversary of the extinction of the dynasty because the last Premyslid King, Václav III, died on 4.8.1306. Mělník used to be the residence of the venerable Saint Ludmila, the wife of the first historically documented Czech ruler, Bořivoj I Premyslid. These days there is perhaps not much need to seek support against any expansion but it certainly is important to seek to raise the prestige of the Czech lands. Miroslav Ondříček succeeds in this with the results of his work and his professional renown. The proof of his public reception is the London film show which also features the British films he worked on. We can learn from the original version of the family tree that Miroslav Ondříček is taking with him to Great Britain that English King Edward IV was a descendent of the first historically documented Czech Prince, Bořivoj I Premyslid, and his wife Saint Ludmila in the 22nd generation. Likewise, English Queen Elisabeth II is a descendant of Edward IV in the 18th generation. The marriage of Elisabeth, the daughter of King of Scotland and England James VI with the Czech ‘Winter King’ Frederick Elector Palatine was of great importance to the family tree. The direct connection between the Czech and English Royal Houses was very interesting. It was the marriage of Anna, daughter of Emperor and Czech King Charles IV of Luxembourg with English King Richard II Plantagenet. Unfortunately, this happy relation was ended by an early death of the Czech princess. 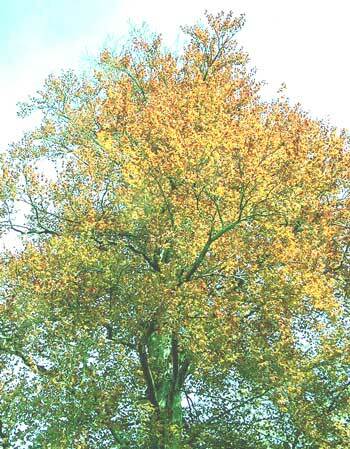 The family tree shows graphically the fact that the ancestors of the English Queen and her husband were also members of the Bohemian families Markvartic, the noblemen of Vartemberk and Lemberk, Bavor of Strakonice, Rožmberk, Landštějn, Lichtenburk and Rožmitál. We are descendents of your ancestors, as the living families such as Sternbergs or Lobkowitz could say to the royal pair. 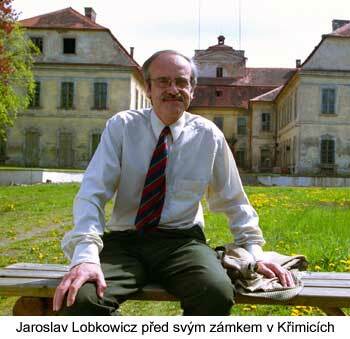 Of course, the living head of the Lobkowitz family, Prince Jaroslav Lobkowitz, could say this too. He and Miroslav Ondříček are the patrons of this family tree. 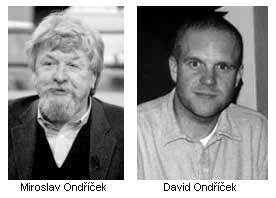 If there were to be a ‘Week of Ondříček Films’ in Stockholm, for example, and if he were willing to go on with his mission, he would take with him the family tree of the Premyslid and their offspring related to the Swedish king, or the king of Spain, Norway, or Belgium, or the descendants of former French kings and those from Portugal. Since the time of Czech King George things have become much faster and distances have diminished. One does not need horses and carriages, not even a three-year timetable to travel around Europe. Missions that deliver graphical genealogical evidence of the relations in Europe from the country in the ‘heart of Europe’ might seem anachronistic these days. But the blood rel ation is logically connected with the political, economical, cultural and religious relations and the vast space of common European history spreads before us. This relation is visible from north to south and from west to east, but also from the ancient period to these days. And the present should interest us in the close connection with the experience of yesterday. If we agree with the dictum that the cultural level of a nation is based on its own history within its memory, this must also apply on the global scale. Genealogical work might be just a start in this area. The pursuit and expansion with other directions and ideas will depend on one’s interest, effort, willingness to cooperate, money, who knows. The aristocracy has always influenced events in all parts of the Europe and scions of ancient families still have encoded in themselves those hundreds of years of experience passed down from one generation to another. They symbolically unite in themselves the past and the present and through their ancestors, they bear the responsibility for the European historical development. Therefore, if they would be heard, lend them an ear. I hope that we have done justice to Miroslav Ondříček with our little contribution to Czech-British relationships in the field of genealogy. When I say we, I mean Pavel Loužecký and myself, the historian, genealogist and translator Dr Milan Buben, Dr Emanuel Bechinie, who is one of the most precise genealogical experts (his family Bechinie of Lažany is one of the oldest in Bohemia). I must also mention a heraldic expert, Petr Tybitancl, the historian Jiří Janáček, the firm Fontes Europae s.r.o., and the National Heritage Trust. archiv Miroslava Ondříčka, archiv Aleny Sísové, archiv Jana Drocára. Tento článek byl v Pozitivních novinách poprvé publikován 21. 04. 2006.